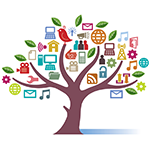 OurDigitalWorld offers a unique processing service that makes heritage newspapers dynamic, user friendly, and fully searchable. Hit highlighting makes it much easier to navigate through dense text, especially with heritage material where low lighting, heavy serif fonts, blurred print and other distractions make skimming difficult. The success of hit highlighting does depend on the quality of images being processed (See What is ‘the best clean copy’?). Click here for an example of hit highlighting results. First, you must ascertain copyright status and secure permission to republish the newspaper collection. 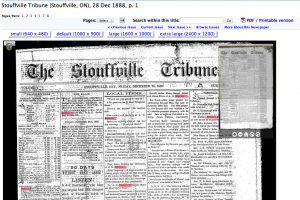 Then, assess the newspapers and find a third party organization to digitize the pages with the best quality results possible (see our Newspaper Digitization FAQ), send us the image files, and we’ll make sure they’re processed properly for hit highlighted results. Talk to us about our All-in-One Newspaper Digitization Service and we can do all the work necessary to display your community newspapers with browse-able pages, issues and publication information, page-level PDF downloads and full text search with hit highlighting. We can also integrate any existing index records (Birth, Marriage, Death, or article indexes) you have in-house to the digitized newspaper collection. See below examples here and here. Your content will be uploaded to the VITA toolkit so you can manage, index, and display your newspaper collection. Subscription plans for VITA News Plus are available here. Interested? Review the Newspaper digitization checklist then submit the information to us using this simple online form and we’ll get back to you to build an estimate for your project. Please also see the newspaper digitization FAQ for more information about how to proceed with your project. For more information about newspaper processing, contact us.